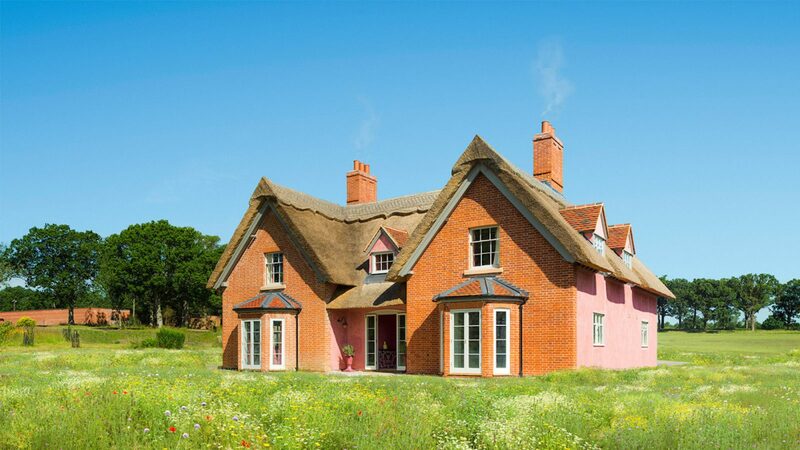 Full of rustic charm, yet bursting with modern touches, The Farmhouse on Suffolk’s Wilderness comes with local-brick floors heated from below. 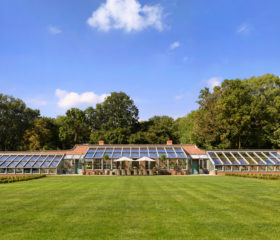 Unwind in vast reception rooms on endless squishy sofas, on the sun terraces, in the hot tub and pool, or over a game of tennis. Don’t forget the Pimm’s. 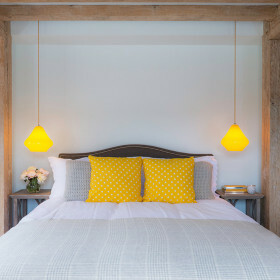 The Farmhouse comes full of rustic charm, yet bursting with modern touches. 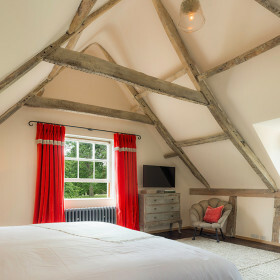 Above your head are oak-frame beams. Beneath your feet, underfloor heating. 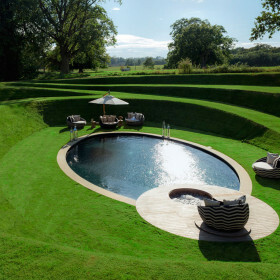 Wade through wild flowers, kick off your shoes, slide into the pool and hot tub and remember what it is to relax. Deep in the Suffolk countryside, among strutting pheasants and lush green escarpments, the only sound for miles is the bleat of sheep. Here, tradition meets modernity. 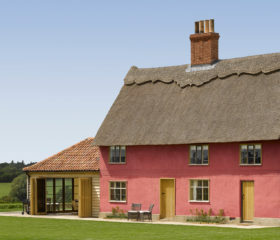 The relaid Suffolk-brick floors are heated from below and the Norfolk long-straw roofing sits alongside the wifi and iPod docks. 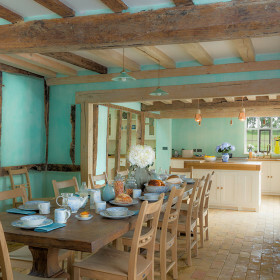 Cook for England – or we’ll do it for you – in the country kitchen, with its oak beams and brick floors. Unwind in the vast reception rooms, with endless squishy sofas designed for dipping into books or supporting you as you blast through a box set or two. Leave the triple-height hall to drink and dine on sun terraces. 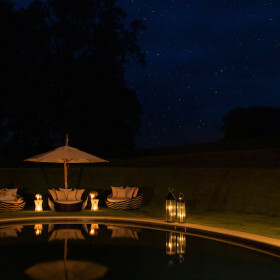 Dive into the starlit pool or hop into the hot tub. 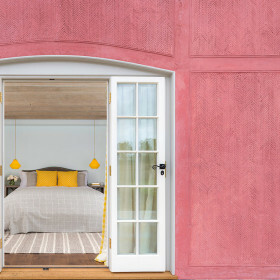 Sleep deeply in vaulted bedrooms with Hypnos beds and en-suite wet rooms. When the sun comes up again, it’s coffee and croissants on the terrace followed by forehands and backhands on the tennis court. Join over 100 bird species, 2,000 nesting boxes and 38 owl boxes in the grounds. This is a world of barn owls and buzzards, where raptors swoop low. Silence here is golden, but only enhanced by the call of the reed warbler or reed bunting. Ponds, lakes and meadows attract butterflies and moths, and an army of amphibians. Bring your binoculars and feast your eyes on the flora and fauna. When you’ve done that, explore further and find man-made marvels galore. 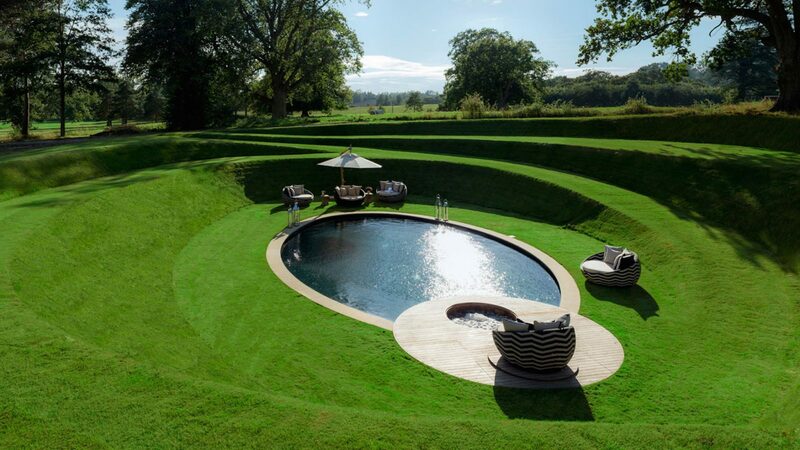 Dive into the spectacular naturally-filtered swimming pool with integrated hot tub designed by leading landscape architect Kim Wilkie. 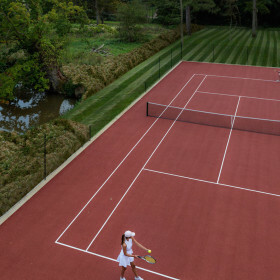 Remember your rackets and bash some balls on the all-weather tennis court. Or make the most of Mother Nature’s gifts and fish or shoot, or simply explore the wilderness and drink in the silence. 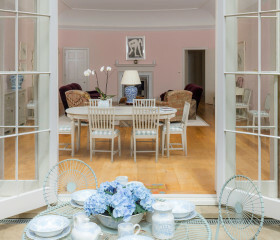 The entrance hall’s an event in itself – pretty in Suffolk pink and perfect for parlour games. 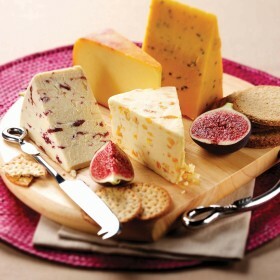 It’s a triple-height treat that’s great for gatherings. But the heart of the home is the breakfast kitchen. There’s a chunky oak table beneath the old beams. This is where you’ll chop and chat, and laugh and linger. There’s a sunny escape from the kitchen, out to the terraces. Drink and dine under the stars. Make a few memories. 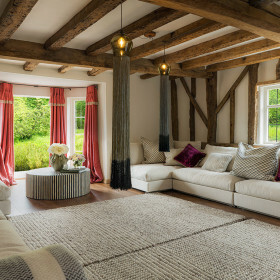 If the weather turns, you can get cosy in the sitting room, with squishy sofas built for books and family film nights. Kick off your shoes and feel your toasty toes on the heated floors. 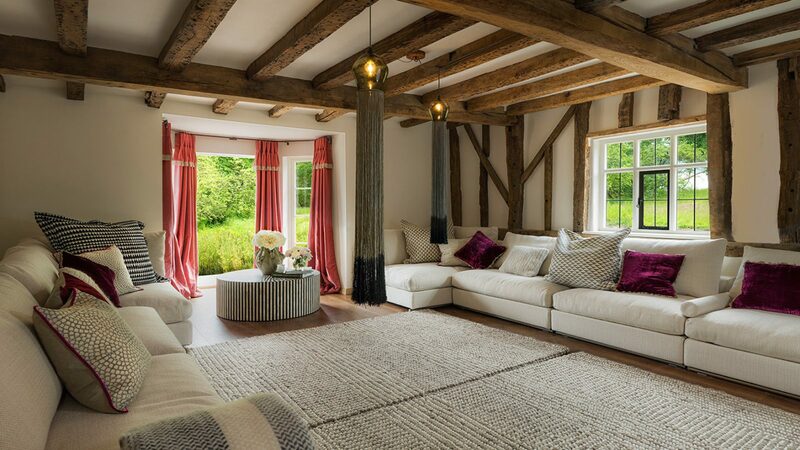 Luxury indeed, but the living areas at The Farmhouse are all about how they make you feel. 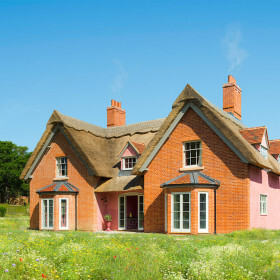 There’s a special authenticity to the traditional Suffolk pargeting details, to the 17th-century oak frames inside and out and to the Suffolk-brick floors. Eat out at The Queen’s Head in Dennington for beer-battered fish and pan-fried seabass, The Crown and Castle in Orford or The Crown in Walberswick. Go gastro at The Westleton Crown, with its hearty rib-eye steak or roasted tenderloin. 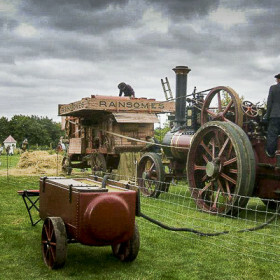 Alternatively, our chef is at home on the range and will even wash up afterwards. 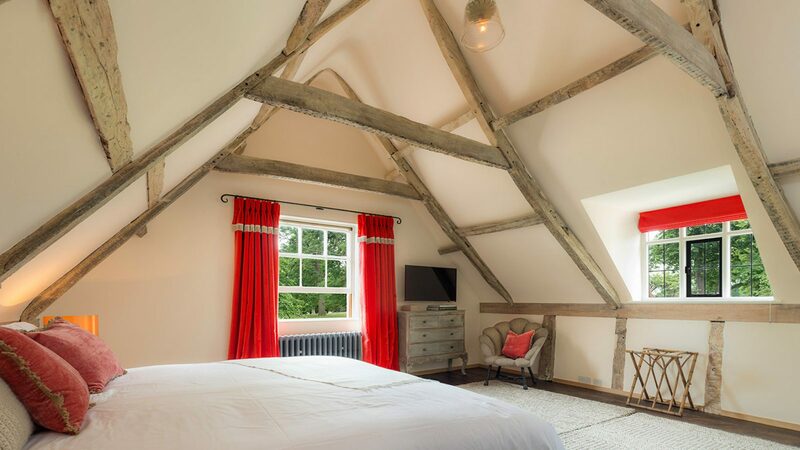 Sleep at The Farmhouse beneath vaulted oak beams and pad barefoot across toasty floors to your own en-suite wet room. 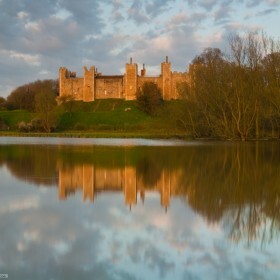 Six en-suite bedrooms, two on the ground floor, come with king-size Hypnos beds, as favoured by Her Maj, and views across the lush parklands to the lake. 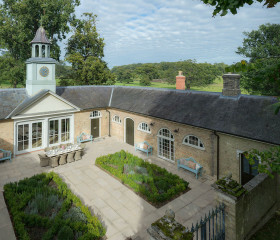 There’s a classical feel here, with the original 17th-century leaded lights and Georgian windows reinstated. Furnishing is eclectic and technology discreet, with large flatscreen HD TVs and iPod docks that set the soundtrack to your stay. Each bedroom is distinct, designed that way to offer you a truly personalised experience and a modern, chic haven. 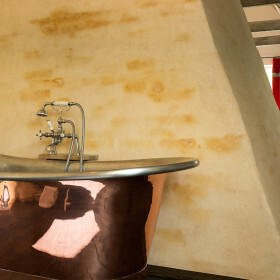 En-suite wet rooms are unashamedly imaginative and rustic. Laze and lounge in rolltop baths or revitalise in power showers. Pamper yourself with luxury toiletries and wrap yourself in soft robes. Make your own bed? There’s no need. Housekeeping is here if you need it. When the sun goes down, you’ll sleep deeply, your dreams rattled only by the call of the reed warbler or the hoot of a barn owl. 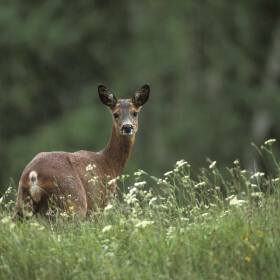 On site, shoot, fish or follow the trails to find fauna that includes pheasants, foxes, deer and barn owls. Elsewhere, the shingly Suffolk coast offers sailing, kite-surfing or waterskiing, or just a picnic in the dunes. 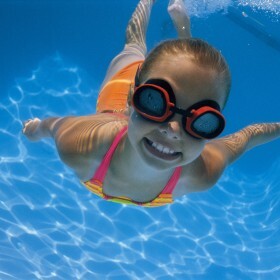 Go wild at Africa Alive!, treat yourself to theatres and theme parks, or brave the Beccles Lido.